The Lemon Lime Scarf came into creation when I saw these two colours paired together. They were just so much fun! And I thought that not only would they look great together, but that this scarf would definitely liven up the winter months. Yep, I’m already thinking of winter because in Canada it’s a long and cold season. There’s a bit of summer left, and hopefully fall will inspire me to create to some lovely pieces for cooler but not brr-ing cold days, but this project was inspired by the knowledge that winter can be dull and drab. But not with the Lemon Lime scarf! Hooking this up will be fun and easy and the splash of colour you’ll add to your winter outwear will bring a smile to everyone’s face. Can you double crochet? Then you are are ready for this project! This scarf uses a V stitch, but it’s made differently than the way I originally learned. 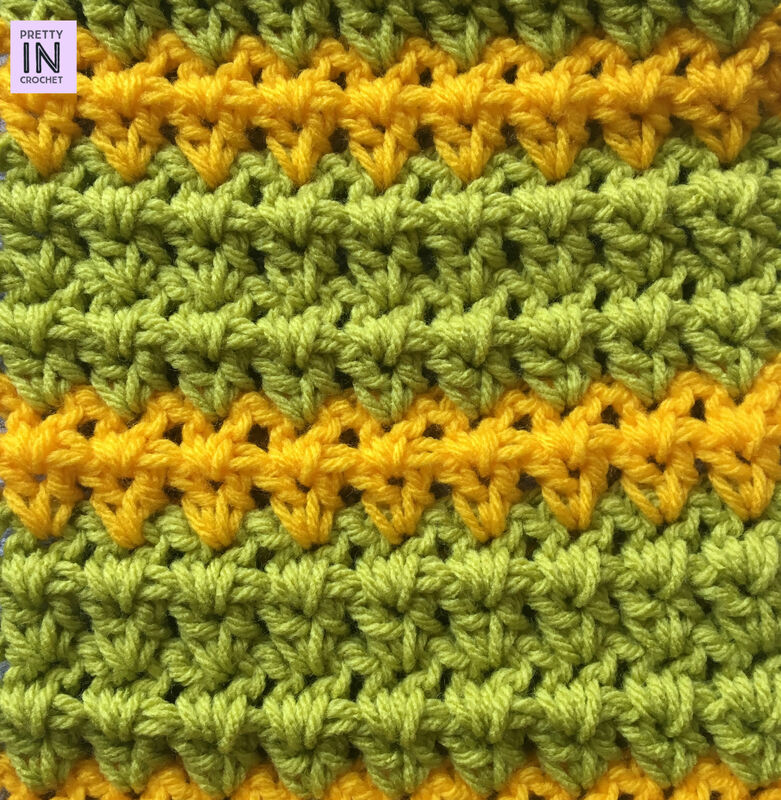 The V stitch is made using two double crochets in one stitch without the chain space between, making this a tighter woven fabric. Let’s get right to the pattern, shall we? Row 2-4: In first V, 2dc. Repeat across. Chain 3, turn. Row 5: Change to Sunny Day. Repeat row 4. Row 6-9: Change to Grass. Repeat row 4. Row: 10-11: Change to Sunny Day. Repeat row 4. Rest of pattern: Repeat row 4, being sure to alternate colours every four rows for Grass, and every two rows for Sunny Day. 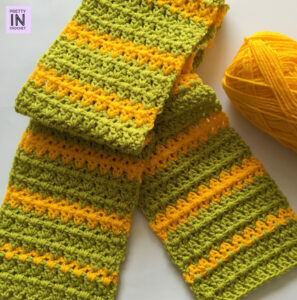 When the scarf has nearly reached desired length, be sure to crochet only one row of Sunny Day, then complete the scarf with four more rows of Grass. 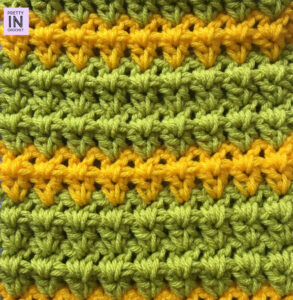 This is an easy pattern for someone who is new to crochet and wants to add a bit of a flare to their projects. Happy crocheting everyone!